Rymska returned to the winner's circle for the first time in nearly 11 months, using a late kick from the outside to outfinish stablemate New Money Honey for a 2 ½-length victory in the 41st running of the Grade 3, $200,000 Athenia for fillies and mares 3-years-old and up on Sunday at Belmont Park. The French-bred Rymska, trained by Chad Brown, settled near the back of the seven-horse field as Hawksmoor led through an opening quarter mile in 23.95 seconds and the half in 48.03 on the inner turf labeled good. Out of the far turn, jockey Irad Ortiz, Jr. moved Rymska out, where she responded by overtaking four competitors in the stretch, completing 1 1/16 miles in a final time of 1:41.59. “I got a perfect trip. She broke well and put me in a great position. I just waited and waited, and when I asked her just before the quarter-pole she was there for me,” said Ortiz, who earned his meet-leading 39th win. “Chad has done a great job with her and she was ready today. I've been riding her a lot and she's a nice filly. Owned by Sheep Pond Partners, Alain Jathiere, Thomas Coleman and Elayne Stables, Rymska won for the first time since the Winter Memories on November 23 at Aqueduct Racetrack. Off at 4-1, the 4-year-old Le Havre filly returned $10 on a $2 win wager. She improved her career earnings to $488,394. Rymska, one of three entries for Brown, was coming off a second-place effort to Candy Store in an optional claimer on August 31 at Saratoga Race Course that ended a nine-month break. Off a shorter layoff, Brown said he was impressed. E Five Racing Thoroughbreds' New Money Honey, the 3-1 favorite, finished second in a graded stakes for a second consecutive start, following a runner-up effort in the Grade 2 Canadian on September 15 at Woodbine by finishing 2 ½ lengths clear of Indian Blessing. Hawksmoor, On Leave, the Brown-trained Inflexibility, and Pas de Soucis completed the order of finish. Mythical Mission and Candy Store were scratched. 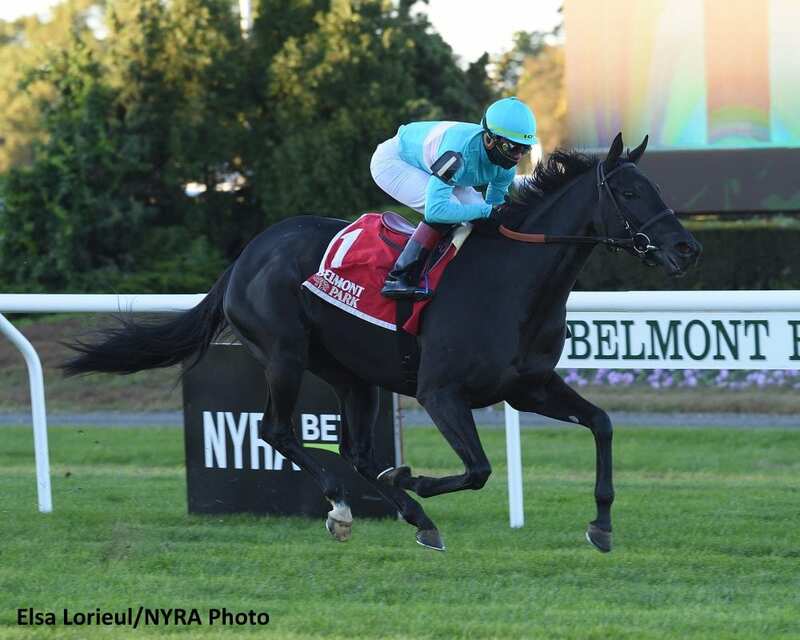 This entry was posted in NL List, Racing and tagged Athenia Stakes, belmont, belmont park, Chad Brown, hawksmoor, Irad Ortiz, new money honey, rymska, sheep pond partners by NYRA Press Office. Bookmark the permalink.